We are a trusted name engaged in offering a broad assortment of Threshers to our clients at market leading prices. Offered range comprises Bumper Model Paddy Thresher, Wheat Thresher, Haramba Thresher, Maize Sheller and Double Wheel Bumper Model Wheat Thresher. These products are demanded extensively in various industries and are appreciated for their dimensional accuracy and durable standards. Besides, our vendors understand the variegated requirements of the clients, therefore make these products available to the customers in various specifications. 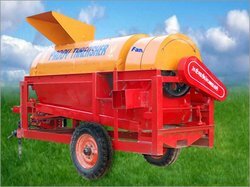 Presenting wide range of Paddy Thresher. These are manufactured by using superior quality iron sheets. 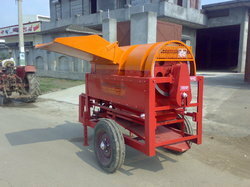 These are is uniquely designed which it positively proves by not exerting extra pressure on the engines of tractors instead gives 25% more output(Paddy) in an hour in comparison to other threshers. In this Thresher there are 3 blowers & 2 filters provided for cleaning the Paddy Crop. 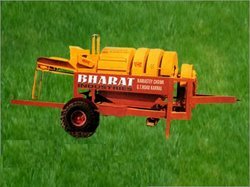 BHARAT PADDY THRESHER fetches Rs 10 per 40 kg extra earnings for the farmers in compared to other grains because of its purity and quality. These are outfitted with two wheels having large radius so that it can be easily moved from one place to another. Clearance adjusting concave winnowing 3 blowers and 2 filters are provided for cleaning the paddy, wheat, gram, Chana, Soyabean, maize, Pulses. Supported by great business acumen & large manufacturing base, we are counted amongst the pioneer manufacturers and exporters of Cutter Fitted Thresher. 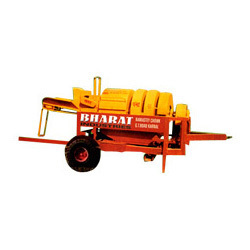 Manufactured in accordance with industry specific guidelines using supreme quality steel and sheets, these threshers are widely used in agricultural fields. Operated with PTO Shaft and Belt Pulley too, these threshers does not require additional tractor power. Before the final dispatch, our Cutter Fitted Thresher is rigorously inspected on certain quality parameters. Instead it gives additional 50% output as compared to other Thrashers. Its capacity is round 20 qtls. per hour with 50 HP Tractor in normal conditions. It can function with smaller Tractor too. Backed by the team of experienced professionals, we are manufacturing and supplying high quality and durable range of Wheat Thresher. Fabricated using superior quality raw-material, these machines are capable of sucking the paddy instantly after placing them in the induction tray due to the fitted automatic feeding unit. To meet the versatile requirements of our respected clients, we are engaged in offering a vast array of Haramba Thresher which is available in different specifications. Our professionals manufacture these machines using cutting-edge technologies & advanced equipment at our state-of-the-art infrastructure.